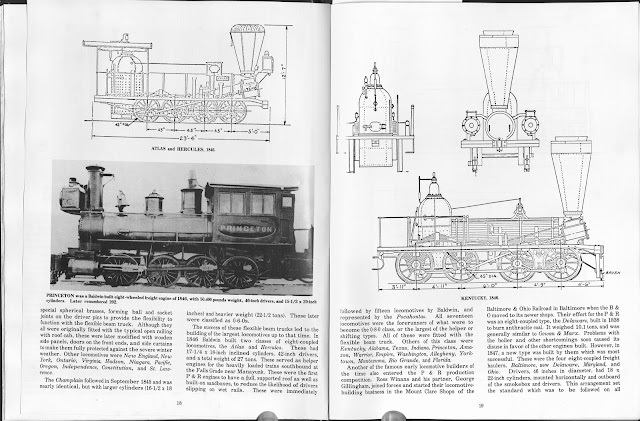 A journal following the history, design, construction and operation of Bernard Kempinski's 1/48th - (O) Scale model railroad depicting the U. S. Military Railroad (USMRR) Aquia-Fredericksburg line in 1863, and other model railroad projects. ©Bernard Kempinski All text and images, except as noted, on this blog are copyrighted by the author and may not be used without permission. The Locomotive Virginia made by Smith & Perkins in Alexandria, 1856. 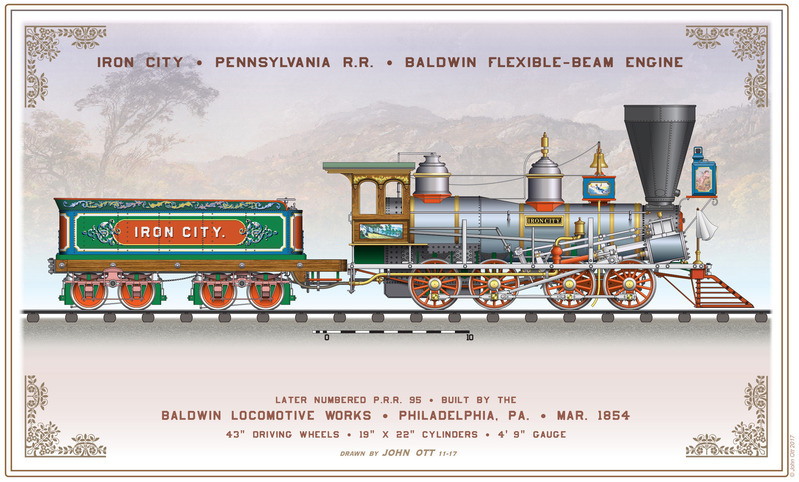 Recently John Ott completed another fantastic drawing of a flexible beam locomotive to add to his collection of early locomotive drawings. If you haven't seen his work, then please check this website, a sample of which is at the right. The new drawing depicts the engine Iron City. I asked if John could do a version of the drawing showing the flexible beam 0-8-0 engine Washington, as used on the USMRR Aquia Line. John quite correctly pointed out to me that the Washington was likely an older and smaller design. He would need to do more research before he could do a proper drawing. for help. Sure enough he hit pay dirt. 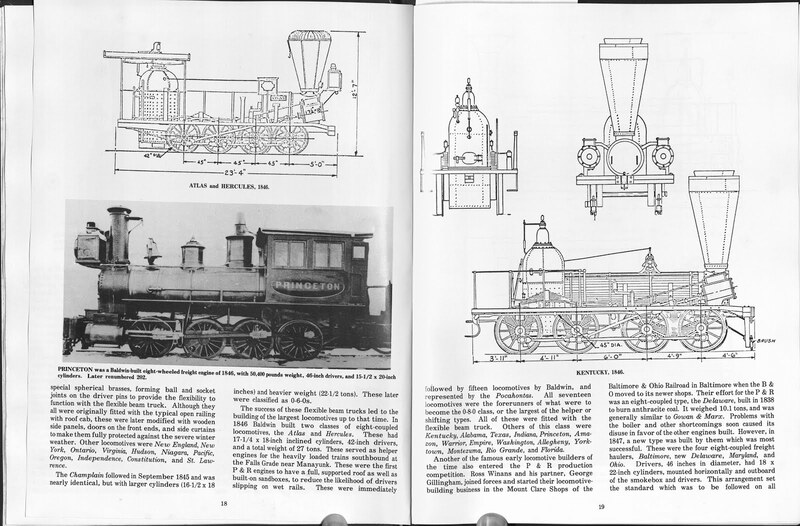 He sent me this scan of by Edward Wiswesser's book, "Steam Locomotives of the Reading and P&R Railroads." 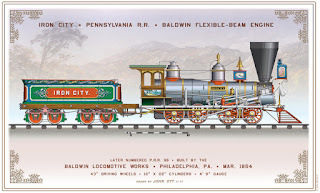 Nick believes that the USMRR Washington was probably of the same class as the Baldwin built P&R Pocahontas, which is similar to the Princeton in the photo below. Although a flexible beam locomotive, it is quite up-to date in appearance for an ante-bellum locomotive. I suppose the loco had a standard tender behind it. Such a loco would make a good scratch building project for me. The laser cutting work station is complete and the laser is back in operation. The first task was to engrave a new train bulletin sign at Falmouth. The previous train bulletin was recycled from McCooks and showed trains Eastward and Westward. That caused some confusion for my boomer operators, so I made a new one showing Southward and Northward, the same as in the time table. For material I used some left over masonite that was finished for chalkboards. Marty left some of this material here after I did a small cutting job for him (actually it was for his wife, but the reason is Christmas confidential). The material engraved nicely and made a good sign. After years of using a simple plywood and 2x4 based work station for my laser, I decided to build a better one. 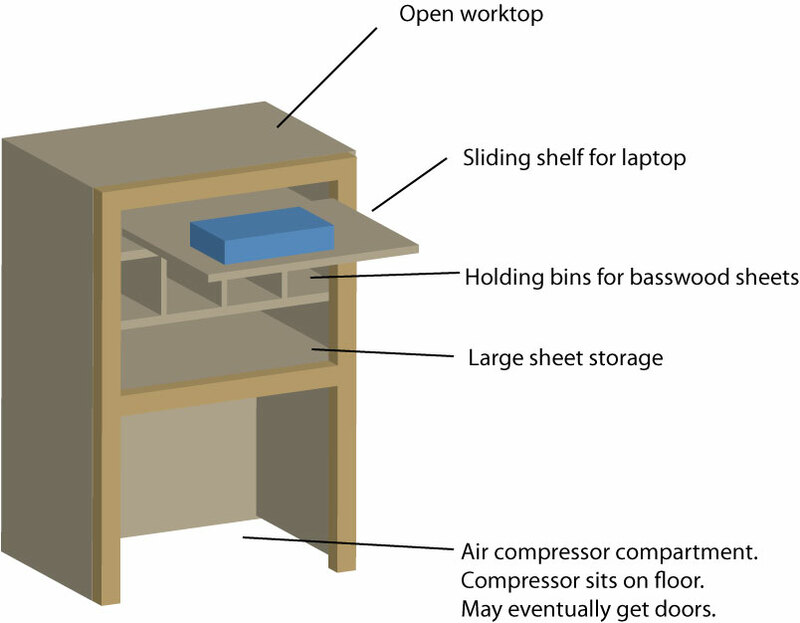 The current work station is inefficient as there is a lot of wasted volume, and tends to get disorganized as there is no good place to store materials. 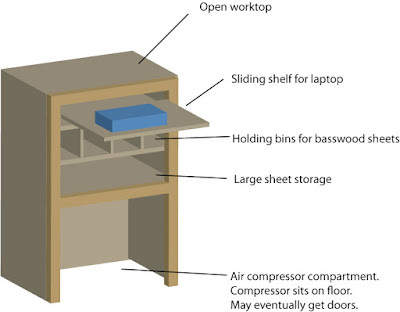 The new design would have places to store materials, a sliding shelf for the laptop, and a place where the compressor sits on the floor to minimize vibrations. I am using this project as a self training exercise to learn how to use some new tools I purchased. Since I have no room for a table saw in my garage, I bought a Festool Track saw and rail, their matching router, and a multifunction table. I also picked up some accessories to help cut things square and parallel. Those included Parf dogs, Seneca Woodworking parallel track guides, and Festool router guide stops. It took awhile to learn how to use the various accessories (yes, I did read the instructions), and I made a few mistakes, but the basic frame is done after day 1. Tomorrow I'll add the sliding shelf, cubby holes and face frame. I'll also drill out the hole for the air line and electric power to the compressor. I may try to add a master switch for the all the electrical components too. Trains 3 and 4 meet at Brooke. This year it was the Washington DC area layout owners turn to host the annual NJ-DC interchange. It is an annual event that has developed over the past few years where layout owners from each region host the layout owners from the other region. We had a whole weekend full of events and op sessions planned for our northern visitors. Alas, I was not fully recovered from my cold, so I only participated by hosting an op session on Sunday morning. My gallant crew of boomers included Henry Freeman, Bill Raymond, Tom Piccirillo, Andy Busgard and Jim Schweitzer. Since the op session had to start in the morning to give the visitors time to drive home, we ran the morning session on Aquia Landing. This was the first time we ran the morning session. Henry and Bill ran Trains 3 and 6, while Andy and Tom ran Trains 4 and 5 back. The initial trains got off to a slightly late start, but they were able to make their meets on time. After a brief learning curve on the couplers and Stanton throttles, both crews did a great job and the trains ran extremely well. Whew! The commissary provided their usual great snacks, this time dark, double chocolate Ghiradelli brownies, coffee and tea. Thank's Alicia. PoLA for most of the session. Prior to their arrival I added two more box cars and a new conductor's car to the Aquia layout. So now all scheduled trains have a conductor's car to run in their train. On Saturday Paul Dolkos, Tony Koester, Perry Squire, Jerry Albertie and Jim Leighty visited my house after operating on Paul's Baltimore Harbor. They got to tour the layout, but did not operate. Later on Sunday Mike Willegal and his wife, Christie, stopped by to see the layout on their way to South Carolina for Thanksgiving. Mike is planning an HO version of City Point. All in all a great weekend. Sadly, I was not the only one that got sick on the Detroit trip. Several of the NJ guys also contracted colds, but they toughed it out to operate this weekend. A few weeks ago I sifted through the conductors reports that I copied at the National Archive several years earlier. One of the reports listed coal as a commodity being shipped to Falmouth. I am really not sure why they were shipping coal at this time. One possibility was to refuel steam boats that landed at Falmouth. But I don't believe the Union forces were sending steam boats up the Rappahannock to Falmouth at this time because the southern shore of the river was in rebel hands. As far as I know, no locomotive on the Aquia Line burned coal. I have message traffic that talks about locos getting wood and water. The USMRR did have some coal burning locos in 1862 that they borrowed from the B&O in service on the O&A, but those locomotives did not make it to Aquia. The amount of coal shipped on the Aquia line was small. So it was unlikely a major fuel source. However, they may have stockpiled coal at Aquia Landing to refuel ships, so some coal might have been available. Perhaps the coal shipped to Falmouth was for use in tent stoves, especially at Headquarters. As I was wondering this, I found a flash news reel from the USMRR Aquia Line that explains the situation . I've included it below to allow the widest dissemination. I made the coal load with a piece of foam painted black and covered with real crushed coal . Like all my loads, it is removable so the car can return empty. To improve the tractive effort of Osceola I filled its firebox with cubes of tungsten. I was able to get about 3 ounces in firebox void. It does seem to improve the pulling power of the small loco. I added another caboose to the inventory this week. During a typical op session we have two trains running at one time, so now each train will have their own conductors car, also known as a caboose. I spent last weekend in the southeastern Michigan area attending an event called, "Great Lakes Getaway." It's a round-robin layout operations weekend hosted by several layout owners from Battle Creek to Northern Ohio. That area is blessed with numerous fantastic layouts and some of the friendliest people you will ever meet. Among the many highlights of the weekend was getting to run the steel mill job on Jim Talbot's WL&E layout. I had so much fun, I spent the weekend wondering how I could fit a steel mill in my layout. Jim asked me to do a video as I operated and I did. I posted it on Youtube here. The next day I delivered the coal dock model that I built for Mike Burgett's C&O layout. It is an honor to be able to contribute to Mike's layout. His layout is a tour de force of realistic model railroading. It is easily in my top 10 list of model railroads. Aside from the beautifully finished layout, he has a separate room up stairs for the dispatcher, and ND Cabin operator in the garage. Both are fully equipped with authentic vintage railroad equipment. My weekend continued with operations on Bill Neale's Pennsy Panhandle layout set in 1939. I had a series of interesting jobs on his impressive layout. I also got a chance to visit Scott Kremer's GN layout. It is an absolutely gorgeous layout with over 5,000 hand made trees and beautiful painted backdrops. I spent a good part of the weekend driving around and having dinner with guys that work for the real railroads. It is always interesting to get their prototype view of industry and how it applies to the hobby. Below is a summary video I shot of the various layouts I visited. All in all a great weekend, except that as usual, I caught a cold. Airplanes and I don't mix. The Aquia Line and PoLA layouts hosted dual (dueling?) ops sessions today. Paul Dolkos and Brad Trencamp ran PoLA. That was the 11th session on PoLA. Meanwhile, four newcomers ran the Aquia Line for its third session. Eric Payne and Ed Kapuscinski took Train 8 out of Falmouth. But first they had to spot the cars that train 5 had left there. At the other end of the layout, Bob Sprague and Scott Wahl ran Train 7 out of Aquia Landing. Ed, Eric and Scott are N Scale modelers. Bob, Brad and Paul have HO layouts. Eric's N Scale layout uses TT&TO, so he was able to jump right in to the ops scheme. Ed models Conrail in the York PA area. Scott builds modules and has a N Scale home layout. Bob is building a new Ma and Pa layout in HO scale. Cornfield meet at Potomac Creek Bridge? Train 8 was late leaving as they had a lot of switching to do at Falmouth. Meanwhile, Bob, the conductor on Train 7, was waiting at Brooke. He realized that 8 was late, so he advanced from Brooke, his scheduled meeting point, IAW a special rule on the Time Table, which is verbatim copy of an actual rule used by the USMRR. Unfortunately, Eric, the conductor on 8, thought they could work Potomac Creek before 7 arrived. Meanwhile 7 was barreling down on them. Luckily they were able to stop on the bridge before crashing, where they sorted out the meet. After some arm wrestling, Train 8 ended up backing up to Stoneman's to let 7 pass (7 was the superior train). You got to love TT&TOs. Eric and Ed also got to use the working brakes on a car spotted at Potomac Creek. Meanwhile, Paul and Brad got their work done on PoLA in about 1.5 hours. They were the first operators to spot the newly weathered auto-racks at Chase Marine Terminal for use by the US Army to take wheeled vehicles being unloaded from the ship. Afterwards, Brad showed Paul and I his design ideas for his new basement, a beautiful 12 by 34-ft space with room for staging in a adjoining utility room. Then Paul took off for home, while Brad stayed around to watch the rest of the session. The crews on the Aquia Line were busy switching and doing a great job. Since they were such good operators, we decided to have Brad run the Generals' Special from Falmouth to Aquia. It was simply a light engine, Osceola, with the general riding aboard. It got priority on the road. Fortunately, it did not disrupt operations too much, as both 9 and 10 were waiting for their scheduled time to leave, so the General's Special had a clear shot at Aquia Landing. This was the smoothest op session yet. The new link design seemed to work quite well. The new way bill system also worked well. I modified it a bit so that each car now has a car card that fits in a small plastic pocket. The waybill is a separate slip that also fits in the pocket. The waybill stays with the load, while the sleeve with car card stays with the car. No more tokens. An empty car has no waybill in the sleeve, a very intuitive system. Two-part waybills in plastic sleeves on the left. On the right is the telegraph message Train 9 received to clear up the line for the General's Special. I also swapped out some stock coupler's (McHenrys?) from some Atlas HO scale tank cars that drove Paul crazy. I also used JMRI to lower the volume on engine 30, though Decoder Pro was buggy in the process (but no this will not be another DCC rant!) Paul has complained about both these issues before, so I finally took action. I learned that I need to get another throttle for the Easy DCC system. I have two now, but will need a third for full ops. Also, we learned that 6 people plus me roving around is a good number for an ops sessions and for the basement in general. It's not too crowded, and everyone gets to stay busy. The commissary (my mom) provide some delicious three-layer Venetian cookies for snacks. All it all it was a very satisfying day. Both op sessions went well. All the crews really did a great job. Op sessions really make the layout come alive. As I add cars to the Aquia Line and features (such as the General Special), the operations are proving quite interesting and rewarding. I weathered 7 more cars for PoLA today, including some with hand painted graffiti. When I do graffiti on a model, I look at actual graffiti on cars to get ideas, but I don't copy it exactly. It's more fun that way. Here are 5 of the 7.